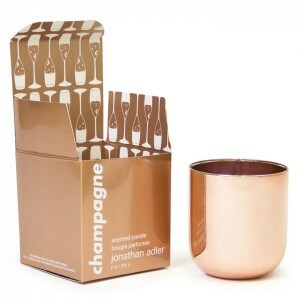 Pop the cork and celebrate with the sweet scent of the Champagne Pop Candle. A fizzy mix of pink grapefruit, sparkling champagne, raspberry, French cassis, violet leaves, rose petals, crushed sage, crisp mint, and grape leaf. The perfect mod pop for any tabletop in a hand-blown, twinkly rose gold vessel, begging to be reused as a bud vase or drinking glass. Each 8oz candle is 3.25″ diameter x 3.25″ high, has approximately 40 hours of burn time and is packaged in a glossy, beautifully designed box.